Coolbest Aircon offers high quality air conditioner chemical cleaning service in Singapore. Our professional technicians are trained in performing this aircon service for clients. We follow good practices and safety guidelines when doing this service. What is a Chemical Cleaning? General cleaning services can clean out dust and other particles inside a well-maintained air-conditioner. However, it might not be enough if the unit has not been cleaned for years or if the unit has been on standby for a long time. The dust, materials, and other chemicals inside the unit might have hardened overtime and can’t be removed by just water and some soap even with the use of a compressor. It is during these situations that using a cleaning chemical to clean your AC becomes necessary. It follows a similar process to the standard aircon cleaning that are used for air-conditioners. 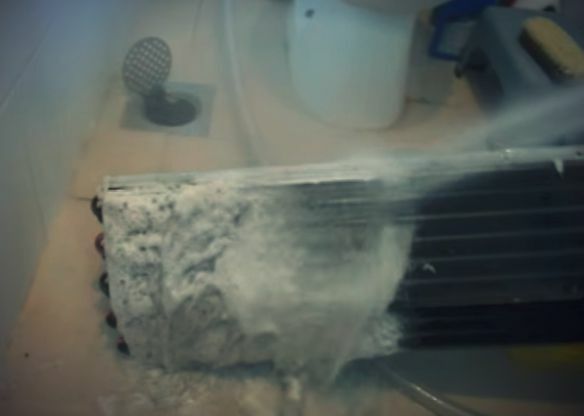 Instead of just water and soap, a chemical solvent is used in the mixture to remove hardened dust and materials in the vents or grease on the fan coil to restore the cooling effectiveness of the unit. It is a cleaning method that will thoroughly clean your air conditioner's drainage, fan coil, and pipes to make it transfer heat and cold air more efficiently. Many have reported that their air conditioner operates like it’s brand new after a full chemical cleaning. All chemicals used in our chemical wash service are stored inside protective containers that prevents the solvent from leaking out. It is to make sure that it won’t spread inside the household and may cause damage to other parts. The chemical wash process will involve safety checks before proceeding to the application of the chemical. Our technicians will be using the needed equipment and wearing the necessary gear to conduct the procedure safely. People inside the house or office building will be advised to keep their distance from where the chemical wash is being done to avoid any untoward instances. Our chemical cleaning is a high-quality service being offered to clients in Singapore. These can be performed for residences, offices, and commercial buildings who have an air-conditioner. Schedule a chemical wash from Coolbest Aircon right here, right now! We have established a reputation among our clients because we work quickly and efficiently on any air-conditioning unit. This helps avoids times when the AC isn’t running allowing you to fight the heat that constantly hits Singapore. Our aircon technicians are well-trained professionals who have certifications to back up their work. They have the necessary skills and knowledge specific to aircon servicing that allows them to render services quickly without sacrificing workmanship quality. Coolbest Aircon offers high quality chemical wash service in Singapore. Our professional technicians are trained in performing this cleaning service for clients.